This will be Brendon McCullum's last BBL and if Heat manages to win, then it will depend on the other results whether he will play one more game. The match 53 of the ongoing Big Bash League (BBL) will potentially decide the four semi-finalists of this season. The Brisbane Heat and Melbourne Stars will lock horns at The Gabba on Friday. 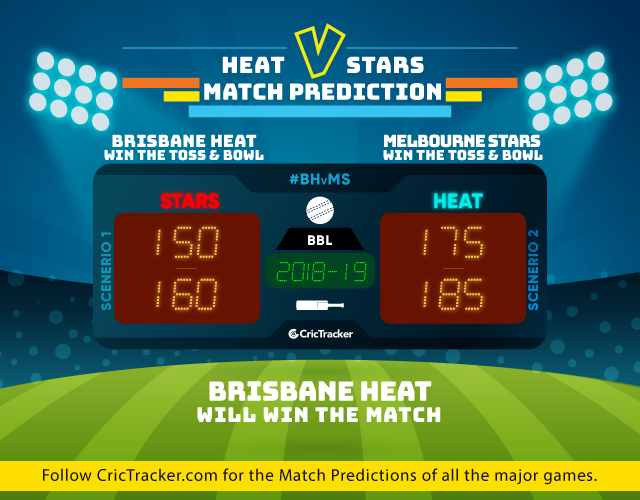 This is the last chance for the Heat to claim the fourth spot and then hope that the Stars lose to the Sydney Sixers in the last league game of the season. With the semi-final spot up for grabs, some exhilarating action is expected from both the teams. If the Melbourne Stars manage to win, they will qualify for the knockout stages straight away and the team will be hoping to do the same to avoid further complications. The Stars lost the previous game to Perth Scorchers stunningly and that opened the gates for the Heat who found the groove a little too late in the tournament. Glenn Maxwell would want one final top performance from his troops in this game. The Heat, on the other hand, will be playing for the Brendon McCullum who has announced his BBL retirement. This could be his last match of the BBL if they lose but the teammates will be hoping for him to continue in the semi-final as well. However, for that to happen a couple of results should go their way. Having said that, the Heat would want to concentrate on winning this game first. The pitch at The Gabba has produced contrasting scores this season. But with this being McCullum’s farewell game, a flat deck might be in store for him to go berserk. Chasing teams have mostly at the venue this year and the trend should continue. The rain will fall all day in Brisbane but the forecast is for the clouds to clear dramatically during the match time. Though there might be a few stoppages during the game. McCullum might open along with Max Bryant in his final BBL knock while Lynn continues to bat at number three. Renshaw will follow him next with Alex Ross and Jimmy Peirson taking care of the death overs. Ben Cutting is a swashbuckler and he could bat anywhere in the pecking order. The ploy to send him to open the innings failed in the last game and the Heat won’t take a chance in the must-win game it seems. Brendan Doggett returns to the squad and will replace Jack Prestwidge in the playing XI. Probable XI: Max Bryant, Brendon McCullum, Chris Lynn (c), Matt Renshaw, Alex Ross, Jimmy Peirson (wk), Ben Cutting, Josh Lalor, Matthew Kuhnemann, Mitchell Swepson, Brendan Doggett. The Melbourne Stars have received a massive boost in Sandeep Lamichhane as the leggie returned after playing in the BPL. He walks back into the playing XI and his duel with Adam Zampa will be interesting to witness. Lamichhane might replace Daniel Worrall in the playing XI as the batting looks fine for the Stars. Glenn Maxwell and Peter Handscomb are expected to do wonders while Marcus Stoinis should be back to his best after an off game against the Scorchers. Probable XI: Ben Dunk, Marcus Stoinis, Peter Handscomb (wk), Glenn Maxwell (c), Nic Maddinson, Dwayne Bravo, Seb Gotch, Evan Gulbis, Sandeep Lamichhane, Jackson Bird, Adam Zampa. The prediction is for the Heat to win McCullum’s Gabba farewell game and then hope for a miracle to qualify for the semis.